Ireland recently became the first country in the world to say ‘Yes’ by popular vote to marriage equality. 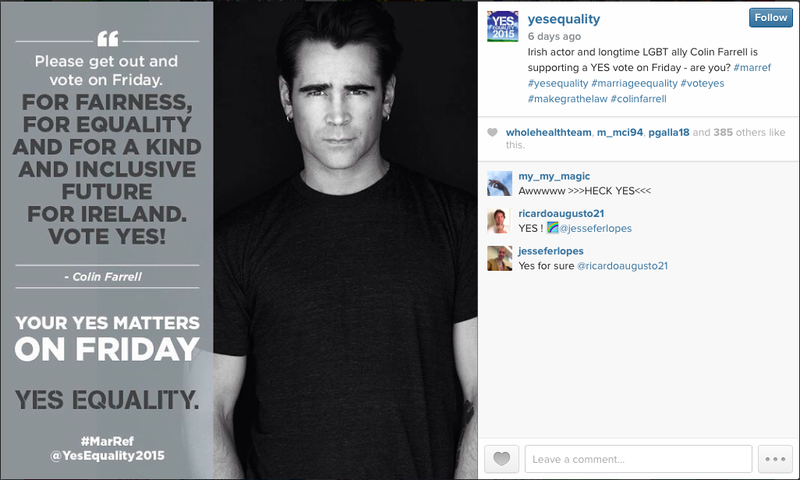 The “Yes Equality” campaign was phenomenally successful in activating and harnessing popular opinion, particularly through social media marketing. While it is impossible to imagine replicating the feel-good factor of this campaign in a commercial marketing context, here are some great marketing lessons we can learn from their success. 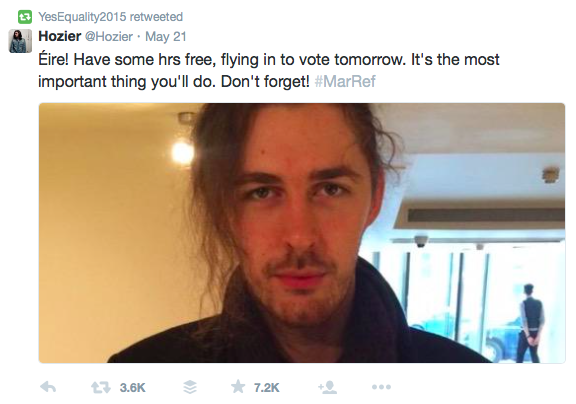 The badges, the twibbons, the tweets, the celebrity endorsements – all fantastic, but the #YesEquality campaign never lost sight of their objective: mobilising people to vote Yes correctly on the day. Even as polling and turnout looked positive on referendum day, they kept up the momentum, using attention-grabbing imagery. Focused on their objective from the outset, they got key building blocks in place early, with a huge push to register college students from autumn 2014. Lesson: Plan ahead and don’t be distracted by tangents or interim successes, keep focused on the final goal. They didn’t just ask people to do something, they showed them how and they explained why – such as linking to research that shows that canvassing works. Lesson: Be clear about the action you want people to take once you have captured their attention. Each CTA was supported by clear material to explain how and why to do it. Lesson: Anticipate and address obstacles people may have in taking action; make it easy for them to take the next step. 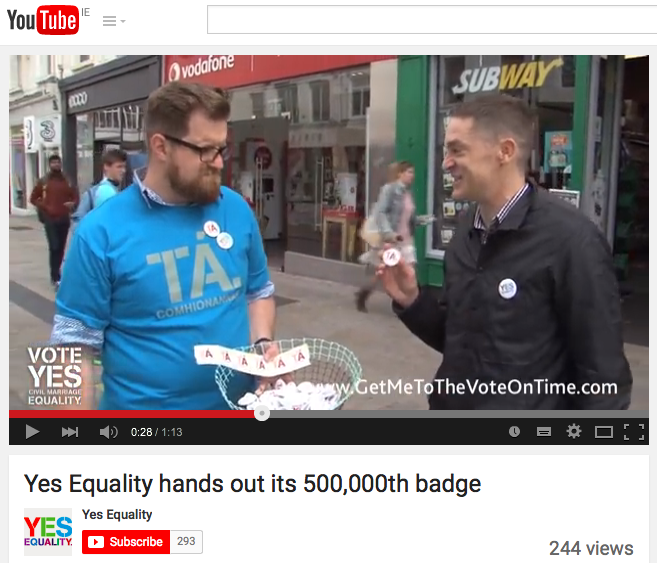 During the campaign, who hasn’t seen someone wearing a Yes/Tá badge on a lapel, social media avatar, or both? They were everywhere, and reams of psychological research confirms the “bandwagon effect”: people want to be on the winning side, or are swayed by the weight of popular support. The #YesEquality ‘twibbon’, which added a declaration of support to social media avatars, was shared 120,000 times on Facebook and 12,400 times on Twitter, facilitated by a pre-written tweet and prominently displayed sharing buttons. On referendum day, the “I’ve voted, have you?” avatar was everywhere, again focusing on the key objective of getting people out to vote Yes. Another psychological phenomenon at play here was “social proof”, whereby people conform and are influenced by evidence of the behaviour of others. The Yes Equality website had prominent links to “Doctors for Yes”, listing individual medics who pledged their support, and “Business for Yes Equality” listing supportive businesses. 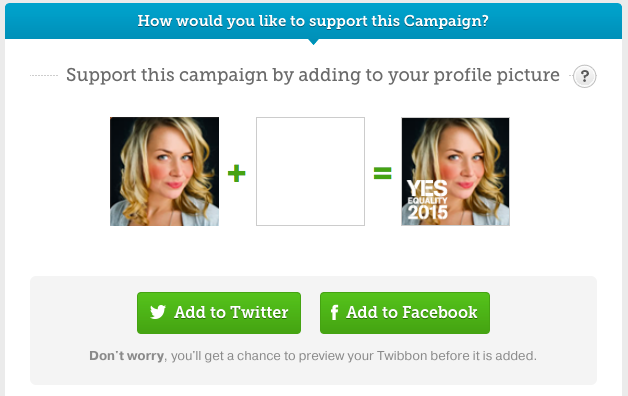 Lesson: Make it easy for people to show their support online, and display their support prominently on your marketing material. The consistent use of the jaunty Yes/Tá branding created by Language design agency reinforced the clear message, while focusing absolutely on the ultimate goal: a cross in the Yes/Tá box on referendum day. 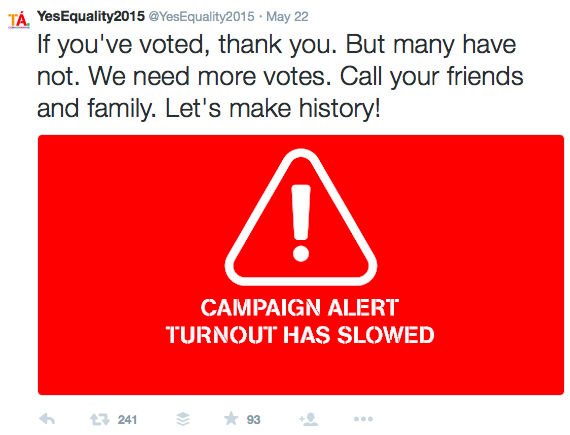 Social media hashtags also played a pivotal role in the campaign, allowing likeminded users to interact and share the #YesEquality message. The campaign used hashtags on printed flyers, posters and embedded on shareable social media images, as well on clickable media. NUIG’s Insight News Lab recorded half a million #MarRef tweets in the month preceding the referendum, with a ten-to-one ratio of yes versus no tweets. 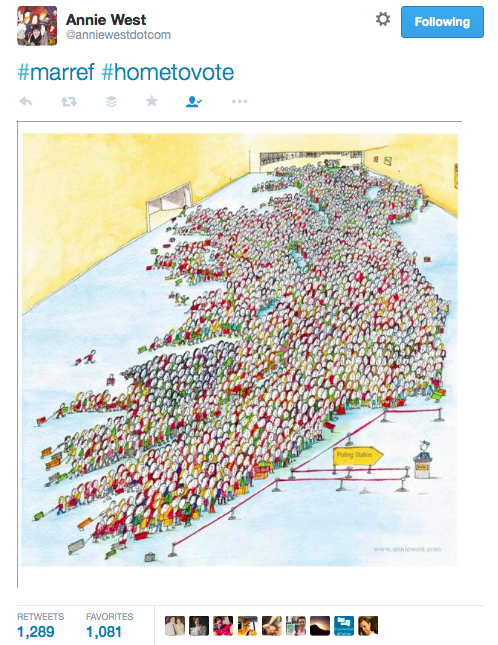 The heartwarming #HomeToVote hashtag allowed the public to experience – and shed a tear over – the heroic efforts made by Irish emigrants to have their votes counted. Lesson: Secure your name across all social channels; brand, post and use hashtags consistently – then let your audience participate. 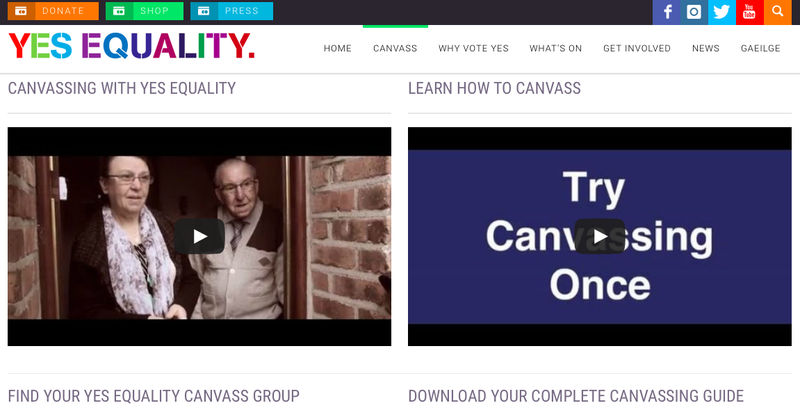 The Yes Equality website worked perfectly on mobile devices: it was easy to view videos, share pages on social media, find a local group, sign up to volunteer, view canvass timetables, donate and shop from your phone. With mobile internet usage constantly increasing, any website that does not work well on smartphones and tablets stands to lose potential customers. Lesson: Ensure all functions of your website work on all mobile devices. Marking milestone achievements allows your audience to join you on your journey. 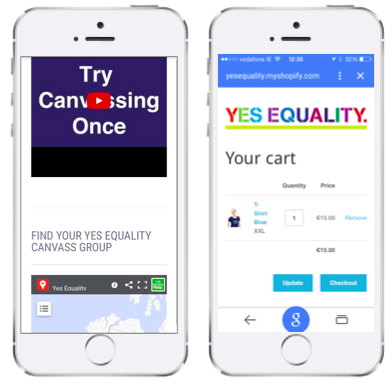 The Yes Equality campaign published and shared their successes, further contributing to the bandwagon effect and social proof, while giving their supporters fresh, positive content to share. Regular blog posts, press coverage, high-profile endorsements, campaign news and milestones reached were published and shared widely. Lesson: Be human, enthusiastic and genuine, so your audience can feel connected with your story. In the end, many would say that it was the personal stories that made the difference. From high-profile politicians and journalists to privately shared individual narratives, people were encouraged to tell others why a Yes vote mattered to them personally. The Yes Equality campaign found these stories and shared them with us. Consistent hashtag use made it easy to find and share stories. When proactive campaigners pushed us to #useyourvote, come #hometovote or #voteforme, the Yes Equality campaign amplified these messages. Lesson: Set up ‘social listening’ to monitor conversations, identify and engage with influencers, allow people to tell their stories and amplify relevant messages. 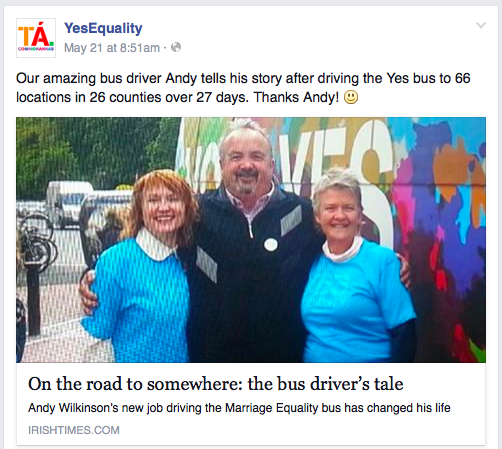 A broad range of offline activities underpinned the success of the Yes Equality campaign: the nationwide tour of the Yes Bus, 60 local Yes Equality groups, press events, voter registration drives and so on. Each of these was complemented by effective, timely online activity. When high profile people from media, sport, music or politics professed their support, their original communication was promoted, along with nifty shareable images showcasing the celebrity and their endorsement. Lesson: Schedule and integrate online and offline activity, and use simple, branded images to encourage social media sharing of key messages. The remarkable success of the #YesEquality campaign was of course underpinned by thousands of tireless volunteers and a nation ready to embrace the future. Not only did it achieve a great result, but it started conversations, opened minds and made us all a bit more compassionate. It also showed us a thing or two about marketing.